Well Chrome, Safari and Firefox are Open Source projects. What you should do is incorporate JPEGXR support into them. Once you do that, and have JPEGXR support as part of HTML5, people will use it. JPEGXR does no animation, no alpha, no hardware acceleration or? hardware acceleration – no new compression standard (see HEVC) is going to have hardware support out of the gate. first step is to get browser support, hardware support will follow. Regarding lack of animation support, a few weeks back I threw together I concept application for an implementation of an “animated jpeg xr”. It would be painfully simple to implement on top of the existing standard, and would degrade gracefully on older decoders. The same method could be used to add layer support, simply have a bit in the header that describes how the frames in the JXR file should be interpreted by the decoder, either as animation or layers. That could potentially be a useful feature too, maybe for advanced profile. I actually read about that specification, but it’s a different file format (and bit stream format I think). I’d be proposing here adding animation support to the existing JPEG XR file format itself. > at such low quality [quality 0-50], but I would guess not many. As a web developer, I can tell you that *all* web sites that we are making these days use JPEG and WebP compressed images in the 25-45 range (same 0-100 scale used by Photoshop or ImageMagick, etc), because we need the content to look good on high DPI (“Retina™”) screens. The current best practice to achieve that is to double the height and width of the image while drastically over-compressing it, and then making the browser display it at half the intrinsic size. So even if the outputed image has horrendous compression artifacts when displayed at normal size, when squished in the browser it looks good, and sometimes great. In this use-case of highly compressed images, WebP really shines. In my tests with the Photoshop plugin, I couldn’t achieve such a drastic level of compression in JPEGXR, even when I set to the minimum value. The tests I did were with the version 1.0 of the plugin. Is the version 1.1 available for download somewhere? Hi Ned. Thanks for your post. I hadn’t seen the highly compressed trick before. I thought that things were heading towards having multiple resolutions available on the server and using something like picturefill (https://github.com/scottjehl/picturefill) to serve the appropriate resolution. Oops, the 1.1 update of the PS plugin got hung up in the posting process, I will get it out shortly. But 1.1 won’t address your < 0 quality request. 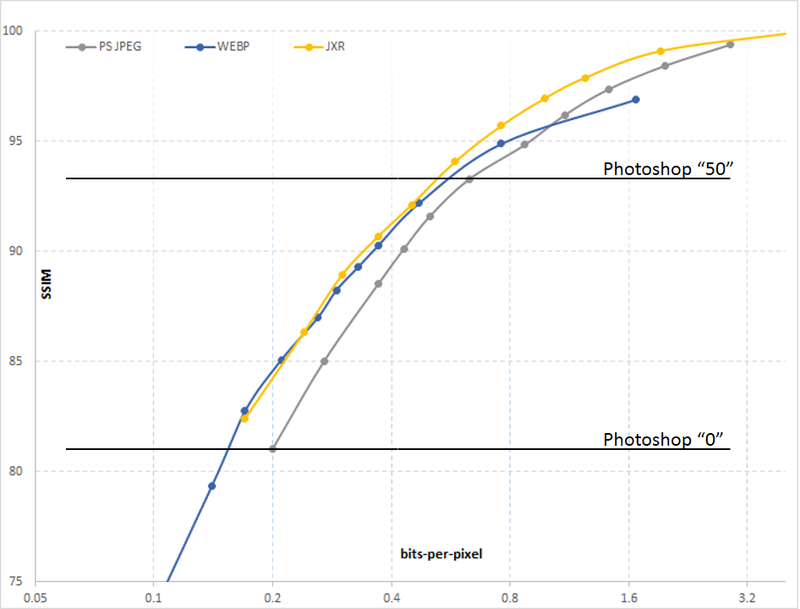 You'll notice in the curves above that we tried to tune our quality curve to match "save for web" curve in Photoshop. So for a given quality slider setting, "save for web" and JXR will give the same perceptual quality but the JXR file will be smaller. We wanted to make the slider intuitive to Photoshop users. Given that, I would expect that you also cannot achieve the super low quality that you want with JPEGs out of Photoshop? There is a work-around however, set the quality to '0' then click the "Advanced Mode" button, you can set the advanced Y,U,V quantization sliders below what '0' would set them to. I’m looking to run some of these tests myself, and the naive run of ImageMagick (using jxrlib) to convert ~100,000 JPEGs showed JXR to be worse than JPEG, at an across-the-board quality level of 85. I’d like to extend the comparison further, but am not sure what’s the best way to do that beyond equal quality bars. – for several images, plot graphs similar to the ones I’ve done above for the ImageMagick JPEG encoder and for jxrlib. This will give you an idea of how the library’s “quality” maps to SSIM. 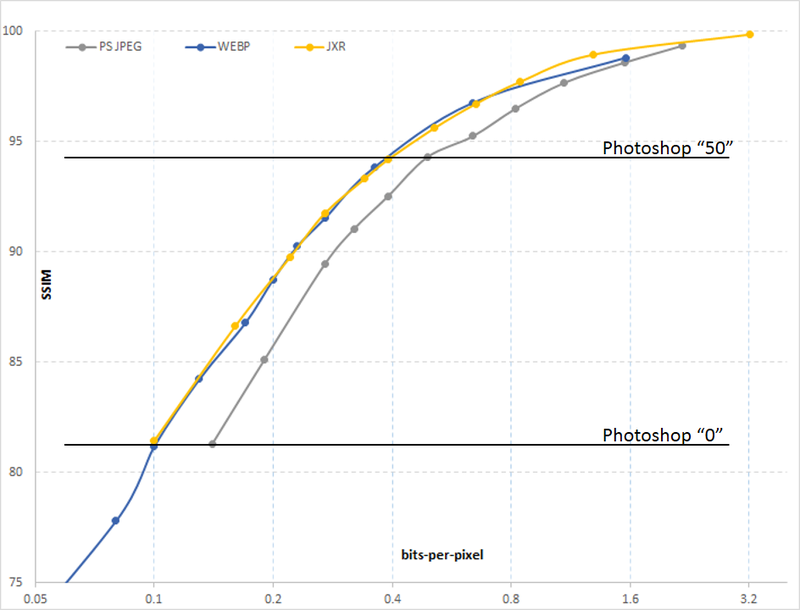 WebP is probably struggling on the high end metrics due to its poorly chosen limited-range color transform (I assume you tested from RGB to RGB) and the fact it always uses chroma subsampling (4:2:0; Photoshop toggles this off for qualities > 50). On the other hand (and this is very subjective), I find WebP’s artifacts at low quality less objectionable than JXR’s, even if their SSIM metric is close.This might be tweakable encoder-side, but JXR still shows a “JPEG2000-like characteristic” which I dislike a lot. 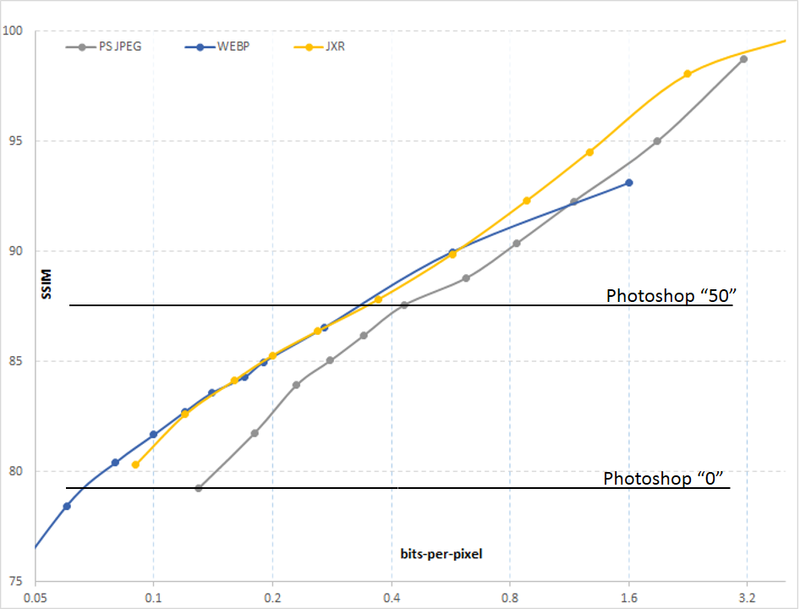 JXR lossless compression performance is pretty poor, WebP’s thoroughly beats it, specially on synthetic images such as screen captures. This is important for the alpha channel, where JXR will have a disadvantage on most cases. Of course the tradeoff is that the decoder is more complex (it uses a completely separate algorithm, unlike JXR). JXR decoding speed is too slow, slower than WebP and much slower than JPEG. I don’t think it should be in principle, maybe it’s an implementation issue in jxrlib. At least encoding is fast enough (still much slower than JPEG). At the current time I think both formats are somewhat flawed: the compression improvements over JPEG are “meh” compared with the really good modern codecs, JXR lacks animation and good lossless compression, WebP lacks in high-end quality and its file format and feature set are kind of duct taped together. The only reason they’re taken seriously is because of the big companies behind giving them a large installed base. Still either one would be an improvement over the current situation of JPEG or PNG, so I’ll take what I can get.